In his home state of Pennsylvania, ten year old Adam Jones started racing motocross aboard a Kawasaki KX 80. After riding for several years Adam made a decision to try Freestyle Motocross and instatly had great success! Adam won 8 IFMA events in his first year of riding alone. Since then he has amassed a number of wins and titles. The highlight for Adam was his return to FMX in the summer of 2004. An injury had sidelined him for half the year, and his first contest back on his bike landed him a Bronze medal at the X Games X in Los Angeles. 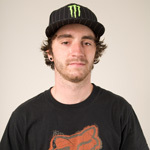 Today Adam Jones is one of the top Freestyle Motocross riders in the world. In 2007 he was named International Rider of the Year as well as won the prestigious title of Transworld Motocross Rider of the Year and today is typically in the top 3 positions in every contest he enters. Adam's work ethic helped him get to where he is today. His desire for perfection shows from his plethora of trophies and medals. Never one to be easily defeated, Adam is constantly out there perfecting that new trick that leaves the other riders in aw.